Up to $30 million in cuts will happen in next year’s budget. Of this, the vast majority of cuts would be from the central office staff and departments, with $3 million from school site budgets. ​It is unclear what amount of teacher raise is assumed into the cuts presented. Prioritize funding school sites: Our community must see evidence that every possible dollar follows students. Keep cuts away from school site budgets. Strategic redesign of the central office: Drive the redesign of the central office by limiting central office expenses to the areas that are 1) legally required, and 2) support a limited number of strategic central initiatives that have the greatest impact on students and schools. Smarter spending practices: Impact on student outcomes should drive the rationale for future budget decisions. The current reality is that those systems and culture are not yet in place, but moving forward, the district must expect that all central office departments establish clear goals, measurable outcomes, and demonstrable impact on student outcomes. Read my blog post from last week for more in-depth thoughts on each of these 3 demands, including why we think school site budget cuts might not need to happen at all. 1. Establish a new enrollment priority called “Opportunity Ticket” as a part of BP 5116.1 “Open Enrollment”. 2. Set aside a percentage of seats to accommodate the impacted students with Opportunity Ticket priority across all schools at the appropriate grade levels. 3. Set up pre-enrollment activities for impacted families, including counseling on school selection, expedited completion of required documents, and personalized communication of lottery results. School closures are painful and disruptive. They should only happen when a clear plan exists for each and every child impacted to get access to a higher-quality school. 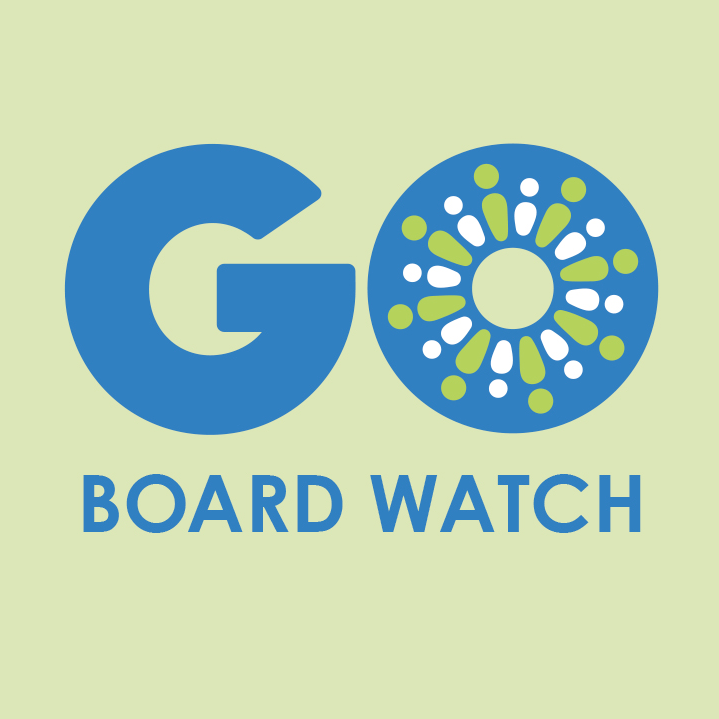 GO believes it is important that OUSD prioritize access to quality schools for students coming from closing schools. According to the Stanford CREDO studyin 2017, student outcomes will not be improved unless impacted students are able to then attend a higher-quality school. District staff will present the approach and rationale for the closure of Roots International Academy (6-8) and expansion of Coliseum College Prep Academy(CCPA) (6-12). It is proposed that this will be the last year Roots will operate as a middle school. Any current 5th graders who will be in 6th grade in 2019-2020, who would have attended Roots, will now have the opportunity to attend CCPA. The Roots students going into 7th and 8th grade in 2019-2020 will have priority placement at other schools. The rationale for closing roots and expanding CCPA is broken down into four key areas: 1) Quality, 2) Equity, 3) Fiscal Sustainability, 4) Access. School closures are painful and disruptive. They should only happen when a clear plan exists for each and every child impacted to get access to a higher-quality school. The OUSD school board has worked on developing 2019 state legislative principles and priorities. 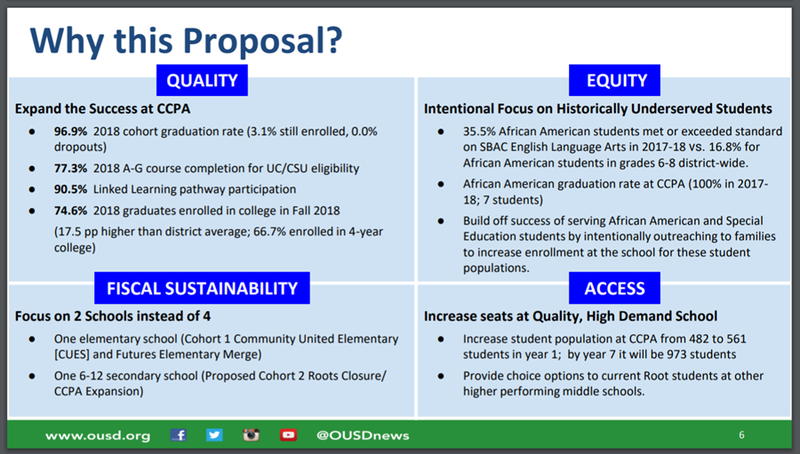 The purpose of establishing these priorities and principles is to provide guidance to OUSD’s lobbyists on what priorities they should pursue for state law in Sacramento. The school board will vote on principles and priorities in the areas of: School Finance; Human Resources; School Facilities; Charter Schools; Early Education; Career Technical Education; Educator Effectiveness; School Climate; and Accountability. While the priorities include strong advocacy for students in areas like more overall education funding and prioritizing early education, there are areas of this legislative agenda that lack smart-policy. The agenda sometimes calls for solutions that would put schools at risk of breaking state law, and in other places calls for very specific solutions that don’t seem well thought-through. Additionally, the priorities regarding public charter schools are inconsistent with the Community of Schools policy passed last June. The Community of Schools policy made a commitment to developing a city-wide plan that looks for district and charter schools to work together to best serve all students. The priorities need more community engagement and more alignment to current board policy before they are ready to be approved.